U.S. Army Staff Sgt. 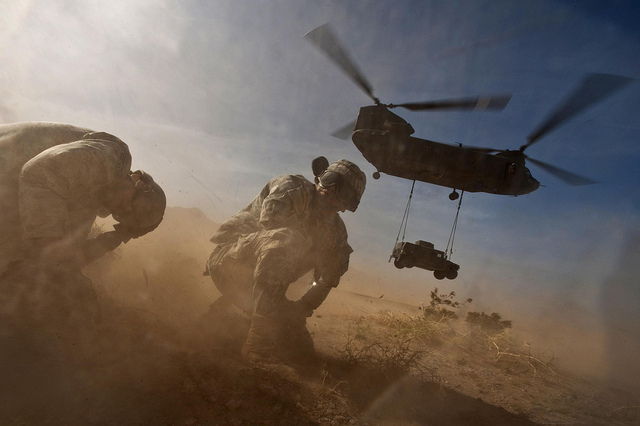 Hector Hoyas (right), an aerial delivery field service department instructor, and Air Force Senior Airman Matthew Phillips, turn away from the rotor wash as a Nevada National Guard CH-47 Chinook helicopter takes off with a Humvee at Nellis Air Force Base, Nev., during sling-load training on April 15, 2011. DoD photo by Tech. Sgt. Michael R. Holzworth, US Air Force.